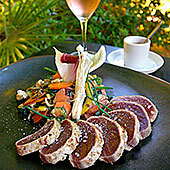 Restaurant "Rivea by Byblos" at Hotel Byblos****, St. Tropez, Riviera, France - GourmetVoyageurs.com. Filled with simple and healthy products, drawn from the French and Italian Riviera from the county of Nice, from Liguria to the Piedmont region, including the Principality of Monaco. 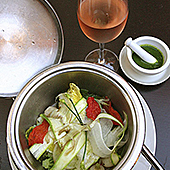 Opened in 2002 as "Spoon by Byblos" also with it's accent on the Mediterranean cuisines, located in the hotel complex of "Hotel Byblos" and just off the main market square Place des Lices in the center of St. Tropez, this is a delightful and modern restaurant. The decor is as modern as is the cuisine both inside and out. The interior is ultra modern chic lit in puddles of light from hanging fixtures; an illusion of privacy is created. Outside the tree shaded deck is a lovely place to eat especially as the light in the sky fades into dark and the patio lighting slowly reveals itself. The massive, low, backless seating has been replaced with more regular chairs and tables. And the eating, alfresco or not, is excellent and a fun experience. This is a Ducasse eatery who is famous for throwing off traditional constraints. Executive chef Vincent Maillard has been with Ducasse for a very long time maintaining the high standards of Ducasse and adding his own talent to the two restaurants under his control both "Rivea" and the pool side bistro "B" that supplies both bar/pool side dining as well as room service. 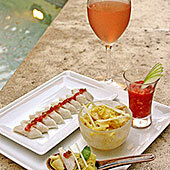 “Rivea” stays close to it's predecessor's philosophy of "Spoon"in its focus on the Mediterranean tastes. It is accessible from the street just up a few stairs on the "Hotel Byblos" site. This is a fun place to eat under the trees yet within a few steps of your room or, in the other direction, from the night life of St. Tropez.